In my Junior and Senior High School days I had a friend who went to many more movies than I did. On at least two occasions he tried to convey to me just how great a movie was. Later I saw both of these movies and was, at the time, unimpressed. I thought both were really good movies but I was not moved to rave about them to anyone as he did, and felt I had kind of missed something. Years later I was on the leadership team for several youth events that were anywhere from a day to a week long, and that affected the participants deeply, both socially and spiritually. Experienced leaders spoke to the youth involved and warned them about the frustration they would feel when they would struggle to convey the impact the time had on them with those who weren’t there. You can’t give someone the experience that you have had, they would warn. And they were pretty much right. My movie going friend had pushed my expectations so high that I could only be let down. This gives the church a problem. When our faith gives us joy how do we invite others into that without setting them up for disappointment? One way that just doesn’t work is to paste on a smile or a happy face and go around exuding what you think looks like joy! I have seen too many smiling preachers on TV and in person to know that this doesn’t make their joy contagious or inviting – typically such a demeanor leaves people confused or wondering how they can be so happy all. the. time! There is something unreal and unsettling about them. What are we to do then? One way to move people into joy is through story, poetry and music. Both have a way of getting around our spiritual barriers and defenses. We all have them and they work pretty well. Then we hear or sing a song or read a poem and tears flow. We are touched somewhere deep inside. Someone has felt something that we have felt, when we thought we were alone in that feeling. Connection. Keep in mind I am not talking about stories, poetry and music that try to make us feel something. Those are just manipulative. Another way to share the experience of joy is to cherish its embers after the flame of intensity dies down and let them warm our hearts. In this way joy becomes something lived everyday – as opposed to something we unpack at Christmas time and demand that everyone not spoil it! This Sunday our theme is Joy! This is awkward because as Christmas approaches people are feeling the price of getting rundown, stressed out and fearful. When you are at the point where you know Christmas will not be perfect (where did that expectation come from?) and you just want it over, trying to make people joyful is a disaster in the making. So we are going to acknowledge our frustrations and fears and sing some songs anyway. We are going to hear ancient words, some joyful, some just telling us what getting ready spiritually means. We are going to reflect a bit on the Why of Christmas and not on the how to endure it. Because in the disappointing quest to make everyone happy we need to pause and remember that someone made Christmas happen. The story is one of loving justice and seeking justice that we might all share in the great gift of self-giving life and love. At our third congregational interim gathering on Nov 25, following the special Baptism service for Charles and Claira Massey, members of the congregation gathered to discern the gifts of this congregation. They did this through listening to stories of how members found their way to Living Spirit United Church and why they have chosen to stay, and, they shared favourite hymns and discerned spiritual themes from those favourite hymns that point to the gifts that continue to feed them spiritually here in this community. 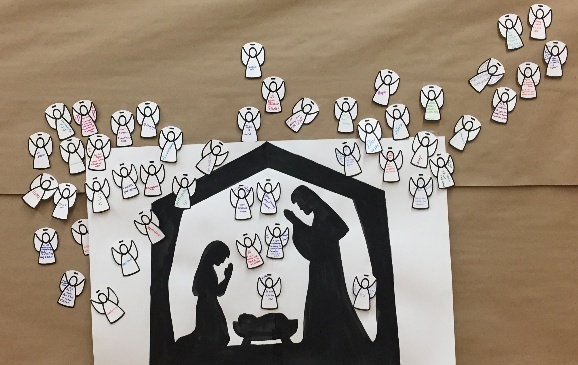 All of the gifts named through the storytelling and the favourite hymn sharing were written down on small angels, and at the end of our time together the members of the transition team named the gifts on the angels and then taped them to the wall around the stable with the infant Jesus at its center. I won’t name all of the gifts named but there were definite themes like: home, family, acceptance, belonging; as well as theological gifts like hope, joy, “My love colours outside the lines” and “Jesus Loves Me”. Please take some time to look and ponder the expression of the gifts of this family of faith clustered around Mary and Joseph and Jesus in the Manger. I will place some extra coloured cards and small angels in an envelope along with a couple of sharpie pens if anyone would like to add to the expression of the angels from all three events. As we move into the new year it will be good to hold the wisdom of our history together and all we have learned; the resilience of coming through hard times together and seeing evidence of the gifts of this community as we prepare to have challenging conversations about where we may be called as a church in the coming months. This Sunday we encounter yet another angel in the story of Zechariah and Elizabeth, the elderly parents of John the Baptism. They had long ago given up on ever having a child, yet an angel delivered a most unexpected message for old Zechariah. With all of our work with angels through these Fall months, we too can ponder what the unexpected angelic message is for us as a congregation, at this point in our life together. Most women of a certain age and pretty much all men of any age do not expect to find themselves pregnant. It seems safe to say that. No fear of contradiction or offense as I am not making any judgement here. Yet pregnant we are . . . pregnant with possibilities. Each of us in any given moment can and will make decisions that will impact our future and the futures of others in small and even big ways. It is a power (a super power?) we all have. However, as the late Stan Lee observed through his Spiderman character, “With great power comes great responsibility!” The corollary, as Peter Parker AKA Spiderman, realizes with great responsibility comes great anxiety. Who are we? What are we expected to do? What if it all goes wrong? These are questions we all struggle with in our youth and, for many of us, well beyond. Sometimes it seems the best thing to do is have someone else make the decisions . . . especially the big ones! And we all need that kind of comfort occasionally. As a lifestyle, however, it can lead us to suffer the negative consequences of other people’s decision making. Not to decide in a moment pregnant with possibilities is, in fact, a decision to accept whatever becomes of that non-decision. Knowing the stories of our faith and the wisdom that can be found there can be an invaluable guide to making good decisions – if we don’t get hung up with trying to be the judge of everyone and everything based on what we find in the Bible. The Bible in its wisdom, properly discerned, warns us against judging others and being more careful about our own decisions. It can also help us develop a loving and caring attitude toward ourselves, our neighbours globally, and God and God’s creation that will help us make decisions with a lot less anxiety. This Sunday we are going to take a look at the story of Hannah in the Bible. You can read part of the story in 1 Samuel 1: 4-20 and the rest of the story in 1 Samuel 2: 1-10 . It is a story of decision and consequence as Hannah, longing to have a child to no avail, promises God that if she has one she will raise him according to a very strict religious order. When she conceives she is delighted and sings a song of joy and expectation. She sees her child becoming one who will turn the world upside down and raises Samuel accordingly after he is born. Well I guess it is better to read the story (and don’t get hung up on some of the names!) and keep reading through I and II Samuel to get the whole picture, one that has global consequences even to this very day. soldiers, sailors, air personnel, and those who provide support for them. infanteers and public affairs officers. for mental health nurses, doctors, and chaplains. for those in the air or on the high seas. and return them to those who love them. On Sunday Oct 28 members of Living Spirit United Church worshipped in the sanctuary briefly before sharing a light lunch and then participating in the second Interim Event, Letting Our Dark Angel Speak, lead by members of the Transition Team and Rev. Shannon. There were 24 people in the room who engaged this challenging topic on behalf of the entire congregation. The process began with prayer, then the Transition Team read an account of Living Spirit United Church’s history since the amalgamation, through to the end of the pastoral relationships between this congregation and Jennifer Ferguson and Traci Hubbard. High points, and low points of this community’s life together were included in this account. The group was invited to add to the account of Living Spirit’s history. Several people did speak with frank honesty to the gathering about their experience of painful times and how they were deeply impacted. What feelings or memories has the account brought forward for you? What is your story of this time in the life of Living Spirit United? What would you like to say to the Angel of Living Spirit United? The listening circles took 15 minutes to consider each of the three questions. At the beginning and the end of the listening circle time, participants were invited to express their responses on index cards. 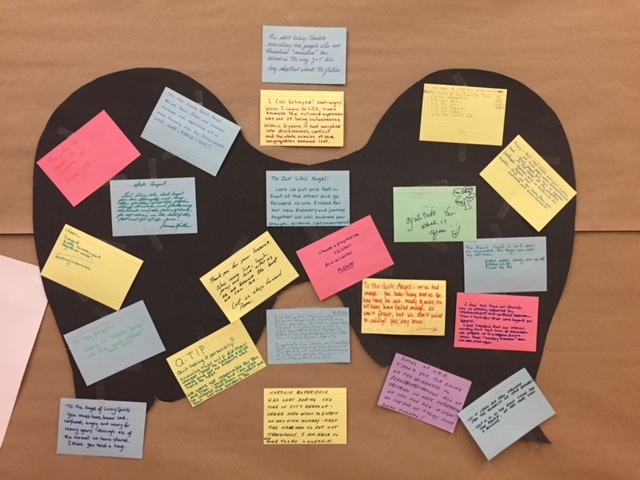 The index cards that people felt comfortable leaving and being made public were taped to the dark angel wings on the wall. The afternoon event ended with Rev. Paul reflecting on the process and praying to close. Many thanks to all who came and participated in this event- thank you for your honesty, your willingness to be vulnerable and your commitment to the healing of this beloved community of faith. If there are folks who were not able to attend the event who would like to have a conversation about how past conflicts at Living Spirit United have impacted their lives, Rev. Shannon would be happy to meet. If anyone is simply interested in walking through the process of the event with Shannon or one of the members of the Transition Team, we would be happy to do that too. This Sunday Oct 28 we will be giving space and time and care to our congregation’s dark side of history as we explore the tensions and conflicts that have shaped us. We have been using a variety of metaphors to talk about this: Skeletons in the closet; Elephants in the room and our Dark Angel. But, as we embark on this exploration of the hurt and disappointment and anger we will hold up what is most important to us- God has never abandoned us and we haven’t stopped being a family of faith. Your Transition Team will work hard to create a safe space where we can hear our story, and where we can tell one another our own stories of how we lived through difficult days and how those difficult days have shaped us. Skeletons in the closet and Elephants in the room= our Skelephants. They are difficult to bring into the light, but they are much more harmful if they are left in the closet or left unspoken about since the skelephants tend to impact our decisions in ways that we cannot know or control so long as we avoid talking about them. The way we take away their power is by bringing them into the light and examining them carefully- and telling the truth about how these skelephants have hurt us. We don’t have to fear telling the truth. The life of our congregation has never been separated from God. Communities of Jesus followers have always had conflicts- that was how they matured and grew and changed. Like our early ancestors in the faith, all our past conflicts have taken place right in the heart of the Divine One who has felt our pain and knows our struggles, and who desires our healing. Come this Sunday and be a part of our healing journey. Some popular theologies insist that good Christians (ie. Heavy donors) are blessed with “prosperity.” Money and luxury are seen as signs of God’s blessing and you get God’s blessing by giving, no matter how poor you are, a substantial donation to their “ministry”. If your bank account doesn’t start bulging and your diseases start healing it is because you are not doing it right and or enough. So give more and you will be abundantly blessed with money, power and goodies. Apparently for this way of thinking God only loves the rich and the poor and sick are cursed by God. Apparently too, God has no love for the poor because they don’t have enough to donate to earn his favour. Churches that promote these highly questionable if not totally repugnant ideas about God and faith end up with massive amounts of money to go on TV and ask for more, proving to themselves and their followers that God really does love only the rich. On the other hand, in many more traditional, mainline churches, too many think that God really doesn’t love the rich. After all the rich are spoken of as the One Percent – a small group who have amassed a massive, excessive portion of the world’s wealth (more that 80 percent) and appear to be causing or aggravating most of the worlds problems. It does make sense that if the economics of the world have enabled you to have multi-billions that you would want to maintain that system even if it is harmful to others and the environment. So how could God possibly love the rich? Aren’t they supposed to give their wealth away or have a tough time getting into heaven? The Bible does have a story about Jesus telling a rich man that in order to enter the kingdom of God he would need to give away all his wealth. This was not just any wealthy person. This was one who is being very strict about obeying all the commandments and yet still feels alienated from God. On hearing the man’s frustration, the Bible tells us that “Jesus loves him.” Here was someone who wants a close relationship, a right relationship with God but finds that playing by the religious rules and banking a fortune has left him feeling more distant, not less. Jesus knows that the man’s wealth was giving him a spiritual problem. Much to the man’s chagrin, Jesus tells him that the antidote to his problem is to free himself from his wealth by giving it away. A pill too tough to swallow. What did we learn from our Angels of Congregations Past? Last Sunday, September 30 we had our first congregational interim event called Angels of Congregations Past. After a WONDERFUL pot-luck brunch we separated into table groups representing the amalgamating congregations of Southminster, Westminster and Riverview United Churches along with a Living Spirit United Church table with folks who have joined the church since the amalgamation. Members of the Transition Team joined the four tables to assist with facilitating the conversation and making notes on four large Angels at each table. Just by looking at the tables we learned that most of the people who attended on Sunday were made up of people who originally came from Westminster United Church and those who have joined Living Spirit UC since the amalgamation, with just a few folks at the historic Riverview and Southminster United Church tables. There were great conversations that took place at the tables with fewer people and important information shared and recorded. The Angel of Westminister United told us that they were the congregation most invested in the success of the amalgamation since they were facing BIG building problems and really had to discern a new future direction. They were also a congregation that was used to dealing with conflict directly, so they dealt openly with the challenges posed by the amalgamation process. The Angel of Southminster United shared that they were a congregation deeply aligned with the United Church of Canada with a heart for social justice and they provided a home base for the Calgary Presbytery Office for many years literally having the members of Presbytery coming and going through their building every week. The Angel shared that the congregation knew that they could not sustain their building and ministry and they knew they needed to make a change but many of the members of the original congregation did not catch the amalgamation vision. The Angel of Riverview United Church told us that the congregation had been viewed within and without as a church of excellence, both in their staffing and ministries. We learned that there was some confusion about the amalgamation process and some in the congregation were not prepared to have their beloved building sold, while others were keen about the vision of building a new church campus that would include affordable housing. We learned of one particularly distressing meeting about the amalgamation where a leader of the meeting made a very bad impression that influenced some members to abandon the amalgamation dream. The Angel of the historic Living Spirit United Church shared some poignant insights into their history giving us some new terminology- when discussing whether there were ‘skeletons in the closet” and how the congregation managed conflict, the Angel expressed that they had moved from having ‘skeletons in the closet’ to having an ‘elephant in the room’—so we now have our very own “Skelephants” keeping us company. We also heard a new term regarding the role of the music ministry at LSU- that it has been the ‘glue’ holding the place together through difficult times—so “Glusic” is an important part of our current life together. The Angel also graphically showed us on their time line that there have been periods of ‘instability’ and periods of ‘stability’ that have seen the size of the congregation grow and diminish. These Angels of the Congregations will come to live on the wall in the fellowship hall. If there are further stories and insights to add to them- please do! We will try to have markers available to continue to tell the story. Your Transition Team took an important lead from the Angel of Living Spirit United in the planning for the next congregational event on Oct. 28 in highlighting the “Skelephants” in our collective room. Human beings don’t just ‘get over’ painful times in their lives- tragedies, losses, grief and deep disappointments without taking some time to heal and find meaning. It is the same for congregations. We don’t just ‘move on’ from difficult times without doing our healing work and inviting our God into our struggles. If we try to ‘just get on with it’ and move into our future without doing the healing walk, the painful parts of our lives impact each of our decisions in “unintentional” ways. So, let’s take some time to get to know our Skelephants— and allow our own Dark Angel to speak to us and for us as we intentionally walk a healing path with the help of the Holy Spirit and healing power of Jesus. On Oct 28 plan to join the conversation where we let the Dark Angel of Living Spirit United Church speak. Your Transition Team has been meeting since last spring, and this is an update about what we have been up to over the past few months. Let’s call it ….A Moment for Transition. You may have noticed that there is a new bulletin board in the Narthex with our pictures, in case you do not know who we are, as well as a suggestion/question box. We really do want to hear from you! You are encouraged to contact any one of us with your questions, concerns, feedback and ideas, as we move through this process. We have been engaged in Team building! We have shared why we are here and why we are passionate about finding a new way for LSUC to continue to exist. We begin each meeting with a Bible reflection. Whether it be Jesus direction to his disciples to “cast your nets on the other side of the boat”…to be courageous enough to try something different….or whether it be Paul’s letters to the early churches urging them to stand strong, stand together, to focus on the light. Now we are not in their exact same position…ie that of being persecuted ….but the message is there for us too…. to stand strong together in our mission to bring Christ’s light and love to this small corner of the world. We have been identifiying goals and direction for the work. One important goal has been to reach out to those who left the church over the past 2-3 years, to inform them of the process of intentional interim ministry, and to offer them the opportunity to meet with Shannon if they would like to talk through their experience, whether they wish to return to LSU or not. In fact, this invitation is open to anyone in the congregation who would like to meet with Shannon, if you too wish to share your feelings around what has occurred over the past 2 years. Now begins the important work of engaging the congregation. There will be a shortened worship service, where you will meet the ANGELS of the Churches past. This will be followed by a Potluck Brunch and then an opportunity for this community to share and celebrate together…..We want to hear each others stories. Where did you come from and why have you stayed? How have the events of the past 2 years affected you? What are some of the positives/highlights of LSUC ministry thus far. So next Sunday, come and worship, meet the angels of the churches past. This is a loaves and fishes event. In other words, bring a potluck something to share for the feast, and bring yourselves to share with each other. October 28 – Celebrate who we are now. Celebrate our relationships with one another and the ministry we have at this point. What is our identity today? A realistic look at what LSU looks like today? What resources do we have to work with? Our financial position, our building and our people…. Our “Talents and Treasures”. What do we have rather than what don’t we have. November 25 – Celebrate the vision and commitment! Where are we going? Can we build a new vision that is realistic, yet attainable. And how can we get there? For each of these visioning events, WE NEED YOU. Your experiences, your commitment to the work of LSUC and the hope you bring for the future. One goal that we identified as a team was to HAVE SOME FUN. We hope that each of these events will be ENRICHING and FUN as well as productive. A Breath of Fresh . . . Challenge? For too long our church although in hope named “Living Spirit” has been on life support! Deficit budgeting is one form as we draw on reserves to see us through from one year to the next. In conjunction with deficit budgeting relying in hope that someone will come through with a large enough donation to fill the annual financial hole has kept our heart beating and our lungs breathing. We don’t want Living Spirit to breath its last. We do not want Living Spirit to die. We are afraid we can’t keep it alive much longer. This note, however, is not about money – it is about what fear, anxiety and despair can do to us. So how does a church move from reacting to negative thoughts and fears to responding in faith? Responding in faith cannot happen in a fearful, anxious, despairing context. We need to keep our heads and hearts involved as we explore past and present realities and future possibilities. Remembering we are a church called to serve not just ourselves but the community around our building and where we reside can help us to pause and breathe more slowly deeply. Responding and acting are counters to reacting and help us be more connected and creative. We are in a process of analysis with the Transition Team and our Interim Minister which will soon involve and engage the congregation in the work we need to do before we can determine our response. May all of this fill your lungs, hearts and muscles with the Holy Spirit, God’s healing, creating, enlivening breath.